Fly Fishing for Salmon Fly Fishing for Steelhead Fly Fishing for Trout & Char are a great way to spend a weekend, fly fishing in the Fraser Valley offers diverse opportunities for anglers featuring rivers that offer year-round fly fishing for resident and sea-run trout & char, rainbow trout, cutthroat trout, bull trout/dolly varden. For any angler looking for a terrific fly fishing adventure in beautiful south-western British Columbia, Chad’s Fishing Charter is the best deal in town. Both resident and sea-run trout and char populate the tributaries of the Fraser River, making the Fraser Valley a fly fishing paradise. From both our Chilliwack and our Harrison locations, fly fishing opportunities are available for cutthroat and rainbow trout, as well as dolly varden/bull trout. Although most of these species run year-round, the down-season runs from May to early August, winter and spring being the most prolific seasons. Book a trip with us today and we’ll arrange it to meet your needs. For a relaxing trout/char fishing charter, email us, call, or stop by, and we’ll set you up. 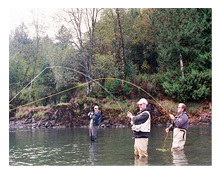 Our local rivers offer fly fishing opportunities for all 5 species of Pacific Salmon. During certain times of the year, our salmon runs are so big that hooking up to 40+ salmon on the fly is a reality…see Highlight Fisheries. It’s hard to believe, but it is true. Some of our guests have landed close to 200 salmon on the fly during a multi-day stay! Starting in late July or early August, the main big runs of Sockeye Salmon appear in our river systems, providing the first good river fly fishing opportunities for salmon. The Sockeye are very abundant (in the millions) and can produce some very exciting days on the fly. This fishery can last into late September or early October. During odd years only (2005, 2007, 2009, etc. 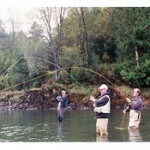 ), enormous Pink Salmon runs enter our rivers in August and September, creating a dream fishery for any avid fly angler. These are some of our largest salmon runs and can number as high as 20+ million fish!… see Highlight fisheries page The fish are very aggressive and are more than willing to chase a fly, providing the angler with constant action all day long. It is safe to say that this is one of our most consistent fisheries and many of our returning guests book their Pink Salmon fishing trips more than 1 year in advance in order to secure their dates. This is a great fishery for both the beginner and advanced fly angler, and also for family and large group outings. With so many fish around, everyone will catch fish! Don’t miss out on this great fishing experience!!! From mid-September to late November, Coho (silvers), Chinook (king), and Chum Salmon arrive in our rivers in great numbers, creating our famous fall salmon fishery! Each year during this time, anglers arrive from all over the world to experience this phenomenal world-class salmon fishing. During these months, our rivers are teeming with some of our largest and hardest fighting salmon, providing thrilling and tackle-busting fly fishing opportunities. Our BIG fall Chinook Salmon can reach weights in excess of 60+lbs and these freight trains have produced empty spools and broken rods on several occasions. Our Chum Salmon’s large size and superb fighting abilities are incredibly tough on the tackle, and busted rods and exploded reels have been experienced in the past. The Chum are the most abundant of the fall salmon species and along with their aggressiveness and willingness to chase down flies makes for a world-class fly fishing experience…see Highlight Fisheries. The feisty and acrobatic Coho Salmon is the icing on the cake to our fall salmon fishery. These scrappy fish are also aggressive and eager to chase a fly but can be moody at times, thus providing the fly angler with a bit more of a challenging experience. 5 species, millions of hard fighting salmon, beautiful Wildlife & Scenery and lots of prolific fly water…what else can you ask for?! If you’re looking for a world class fly fishing experience for salmon, give us a call and we’ll be glad to give you all the necessary details and information. Several of our rivers have good populations of both resident and sea-run trout and char. Fly fishing opportunities are available for cutthroat and rainbow trout, and dolly varden/bull trout as well. Although year-round fishing is available for most of these species, fall and winter/spring months produce better than average results. These peak feeding periods coincide with the spawning salmon in the fall (egg patterns) and the emerging/migrating fry (fry patterns) in winter/spring. The resident and sea-run cutthroat trout are very popular amongst many local fly anglers, as they can be very aggressive, are scrappy fighters, and can reach lengths of over 20+inches. Half the fun is trying to find a school of surfacing trout that are slashing at young fry or taking in floating eggs below spawning salmon. Once found, a well-presented pattern will usually produce exciting strikes! If you’re looking for a relaxing trout/char fly fishing experience on one of our beautiful rivers, give us a call and we’ll be glad to arrange a trip for you.